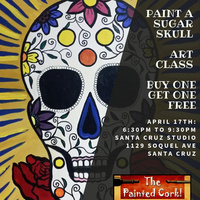 Come enjoy the SUGAR SKULL class at a BOGO price!! Purchase ONE seat in the class and bring a friend for FREE! Your $45 purchase for this class is worth 2 spots in this class. That's only $22.50 per person if you're going dutch! Please check out as a "Single guest" for 2 people and a "Group" for more than 2. Please also add your friends name in the comments box at check out. This special is not transferrable to other classes. Please note that this class is for ages 21 and up. Please check out our Family Room classes at our Folsom location for kids painting classes for ages 7 and up.